At Barron Swim School, we developed our program to create the best environment for children to learn to swim by attending a regular weekly class. While we understand there are times when missing class is necessary, here are the reasons regular attendance is so important and what to do when you have to miss a class. For students to learn best, we provide the following in your regular weekly class. REPETITION: The more practice you get, the quicker you learn. Weekly attendance allows students to receive instruction on a regularly scheduled basis. Taking longer breaks between learning often leads to regression of skills and comfort in the water. CONSISTENCY: Attending your regular class every week gives your child the opportunity for consistency in their teacher, the office staff greeting them, and the friends they make in class. Our teachers get to know each child and tailor learning to their individual needs. Knowing what to expect from their swimming experience greatly improves a child’s comfort level allowing them to further their learning without fear. EXPOSURE TO CURRICULUM: We developed our lesson plans to support each level’s curriculum providing a natural flow of skill exposure over time. This enhances our student’s ability to build on their skills from week to week. Missing one week of lesson plans causes a disconnect in the learning order and your child may not learn a specific skill until it comes around in the lesson plans again later on. EVALUATION: Students are only evaluated in their regular weekly class because their teacher is familiar with their individual progress and able to challenge them to acquire skills. When attending a make-up class with a different teacher, that teacher is not familiar with the exact strides your child has made in class, so they will tailor learning toward safety over pushing them to achieve skills on their own. The reasons above demonstrate why committing to your child’s weekly class will allow them to become safer in the water faster. Sometimes, sickness or another obligation may require you to miss a class. We have found that many children’s sports don’t allow for making up a missed practice or game. At Barron Swim School we feel it is worthwhile to offer options for getting that practice time in the water. First, to be eligible for a make-up option, we ask that you let our office know you are missing class. It’s easy to report an absence online or email/call our office to let us know. Make up in another class: The make-up class must be the same level your student is currently in. We only schedule make-ups in unfilled classes to maintain our standard ratio for safety. Since we often need absent spots to have space for make-ups and our students can move up levels at any time, we only schedule make up classes up to 48 hours in advance. 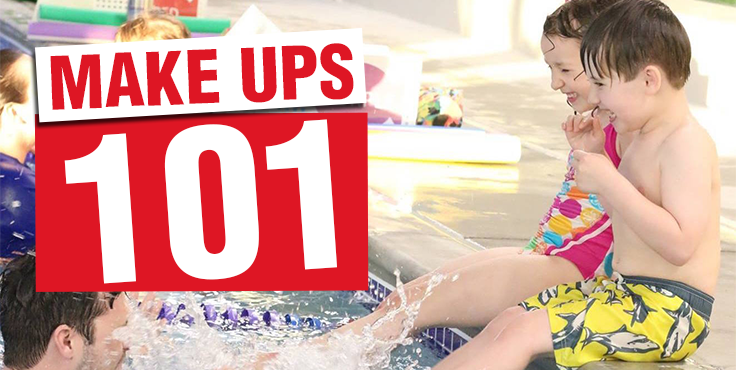 Attend a family open swim for free: This is a unique opportunity to get in the water with your child and see how they are doing in person. Props, toys and a teacher are available to help you work with your child on their swimming skills, or to have a little fun exploring in the water. You may schedule these with the office as far in advance as you would like. Click here for our full make-up policy online including links to report an absence or request a make-up. barronswim has contributed 24 entries to our website, so far. View entries by barronswim. © 2019 · Barron Swim - Web Design by Beanstalk Web Solutions.